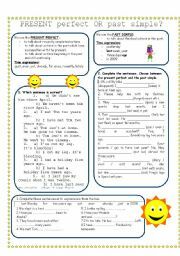 Fully editable worksheet with key.Students revise different connectors used to express cause and result. Hope you like it. 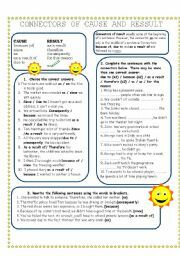 Worksheet to help students master the use of the relative pronouns who, which and where. Hope you find it useful. Have a nice day! Michael Jackson�s Thriller song, to work along with the video. Hoping it�s useful. You tube video link provided. Have a great week!! 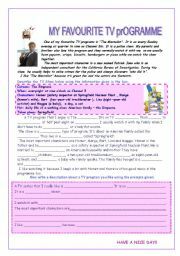 Fully editable worksheet to help students write about their favourite TV programme. Hope you like it! 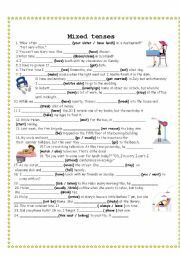 Some grammar tips and exercises to help students understand when to use the present perfect or the past simple. Hope you like it. 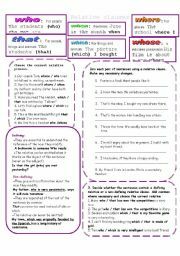 Fully editable worksheet to practise relative clauses. 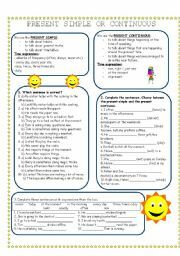 it includes some grammar explanations and three exercises to help students master the use of the different relative pronouns. Have a nice evening. 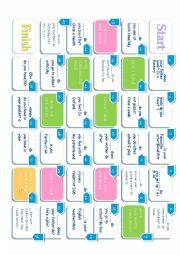 Boardgame to revise the use of question words. Thanks to jecika for the template. Have a nice weekend!!! 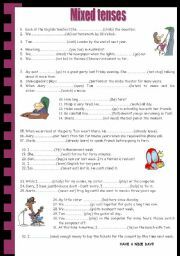 Fully editable worksheet for revising present, past and future tenses. 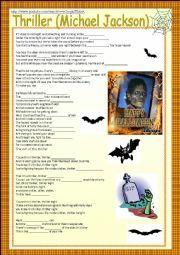 Thanks Zailda for sharing your templates. Hope you like it! Have a nice evening! !